No test in pulmonary medicine is fraught with more confusion and mystery than the cardiopulmonary exercise test, or CPET. This is a test that reports a large number of physiologic measurements during exercise when the patient is asked to exercise to his or her maximum effort. On the one hand, there is a wealth of information in all of those numbers but on the other hand, most physicians don’t know what to do with all of those numbers. As a consequence, the CPET is one of the most under-utilized tests in the hospital. There are several very detailed guides to CPET interpretation, such as the ATS/ACCP Statement on CardiopulmonaryExercise Testing, but these have so much detail that they can be difficult to approach by the average physician. In this post, I will go over a very basic approach to CPET interpretation, albeit one that is fairly oversimplified. I will then cover a second, slightly more advanced approach to CPET interpretation. Physicians of different specialties use the CPET for different purposes and look at different physiologic measures. I am going to focus on the use of the CPET from the pulmonologist’s vantage point. Although there are many reasons for ordering a CPET, the most common reasons are (1) to determine the cause of a patient’s dyspnea, (2) to determine if a patient can tolerate surgery or lung resection, and (3) to determine whether a patient is disabled. From these different measurements, a computer is able to calculate a large number of physiologic variables and can generate a large number of physiologic graphs. This is where the CPET report can get overwhelming for many physicians in that there are so many numbers and graphs that it can seem like you are drowning in data. But there is good news… you can ignore most of the data and still get the information that you need from the CPET most of the time. Here are two ways to approach the CPET, a basic interpretation approach and an advanced interpretation approach. This will answer the questions “Is the exercise impaired?” and “If so, is impairment due to heart disease or lung disease?”. Look at the mVO2 (maximum oxygen uptake). If it is reduced, then there was abnormal impairment to exercise. If it is normal, then the patient can exercise normally and is not impaired; most of the time, this means that you can stop here. Look at the reason for stopping exercise. Most of time, patients will stop because of leg fatigue or shortness of breath. However, if the patient has chest pain, it may be a clue to myocardial ischemia. If the patient had calf pain, it may be a clue that they are limited by claudication. If they fell off the bike or couldn’t keep the mouthpiece in place, then the test is invalid. Look at the heart rate. If the patient reached a maximum predicted heart rate, then exercise was limited by the cardiovascular system. A normal predicted heart rate = (220 – age). Anything > 90% of maximum is considered abnormal. Note: normal people are limited by their cardiovascular system so if the mVO2 is normal (indicating no exercise impairment), then the patient should reach a maximum predicted heart rate. If the patient is taking a beta blocker, they will not reach a maximum heart rate and so the heart rate analysis will be indeterminate. Look at the mVE (maximum minute ventilation). A normal person should have an mVE that is < 75% of predicted, in other words, a normal person’s exercise is never limited by their lungs. Another way of saying this is that we are all born with 25% more lung than we actually need. The predicted maximum minute ventilation can either be calculated by the equation [FEV1 x 40] or by having the patient breath as rapidly as possible while sitting at rest for 30 seconds then multiplying the result x 2 (this is called the maximum voluntary ventilation or MVV). The difference between the predicted maximum minute ventilation and the actual maximum minute ventilation during the CPET is the “ventilatory reserve”. If the mVE is > 85% of predicted (i.e., the ventilatory reserve is < 15%), then the patient is abnormally limited by pulmonary disease. Look at the oxygen saturation. A significant drop is > 4%. The oxygen saturation does not drop when a normal person exercises. If the oxygen saturation falls, then there is likely pulmonary disease. Look at the blood pressure. Normally, the systolic pressure goes up during exercise but the diastolic pressure stays the same. If the diastolic pressure rises, then hypertension could be the cause of the patient’s limitation. Normally, at peak exercise the blood pressure should be < 220/90. Look at the EKG. If there are ischemic changes, then heart disease may be the cause of exercise limitation. Using the basic approach will usually allow you to stratify patients into 4 categories of exercise limitation: (1) normal, (2) cardiac, (3) pulmonary, or (4) non-cardiac, non-pulmonary. This table is not perfect. For example, many patients with heart disease may reach a maximum predicted heart rate but have a normal diastolic blood pressure and no ischemic changes on the EKG. Similarly, some patients with lung disease may have a maximum minute ventilation > 85% of predicted but do not desaturate. 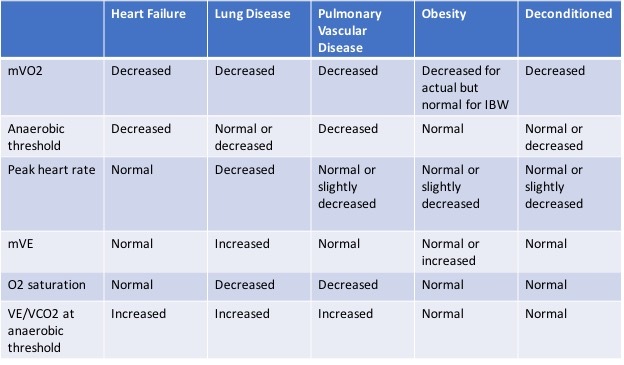 In other words, patients with abnormal cardiovascular or pulmonary limitation do not need to have all of abnormalities listed above, just one of them. Also, the category of “non-cardiac, non-pulmonary” is very broad and can include patients who gave a poor effort on the test, patients with neuromuscular disease, patients with peripheral vascular disease, those who are deconditioned, and those who are obese. If you are ordering the CPET to determine if a patient is able to undergo lung resection surgery, you can just focus on the maximum oxygen uptake (mVO2). Those patients with a relatively preserved mVO2 can generally undergo lung resection safely. This can be a particular help in those patients with lung cancer and a low FEV1 who might appear to be high risk based on spirometry. However, the cardinal rule of lung cancer treatment is to never miss an opportunity to send a surgically curable patient to a surgeon, so the CPET can sometimes give you the confidence you need to proceed with surgical resection. 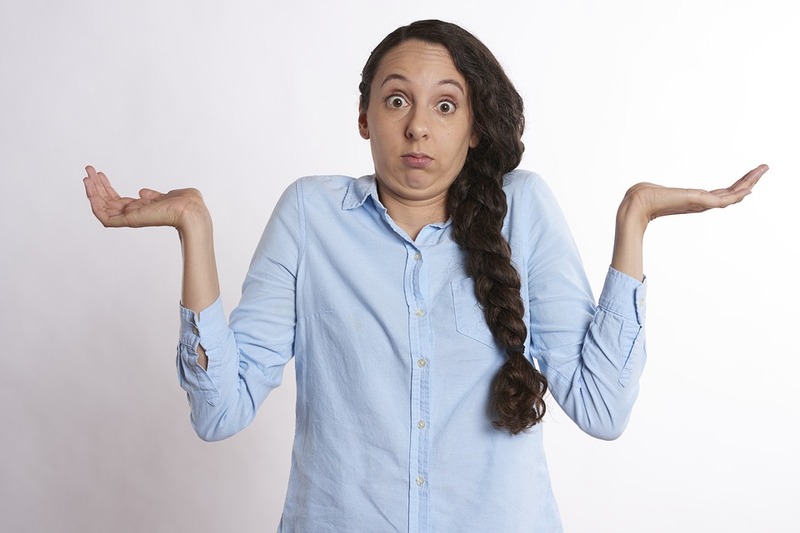 If you are ordering the CPET to determine disability, then there are gradations of disability that are used in the AMA’s Guides To The Evaluation Of Impairment that are often accepted by disability granting agencies. Disability can be stratified by disability class or by the percentage of the whole person that is impaired based on the mVO2. If the basic approach is “CPET 101” (freshman level CPET interpretation), then the advanced approach is “CPET 201” (sophomore level CPET interpretation). There is an even higher level approach to CPET interpretation (“CPET 401”) that is covered by the ATS/ACCP Statement on CardiopulmonaryExercise Testing. The advanced approach relies on analysis of the anaerobic threshold and analysis of the physiologic graphics generated by the CPET. The blood lactate level rises. However, serial lactate testing is usually not used in a CPET since it would require blood draws every 30-60 seconds. The production of carbon dioxide rises disproportionate to the consumption of oxygen. This can result in the VCO2 (carbon dioxide production) rising faster than the VO2 (oxygen consumption). In this graph, The VCO2 is plotted on the vertical axis and the VO2 is plotted on the horizontal axis. In normal aerobic metabolism, the relationship between the VCO2 and VO2 should be a straight line. Once the exercising patient shifts into anaerobic metabolism, the VCO2 starts to go up faster than then VO2. 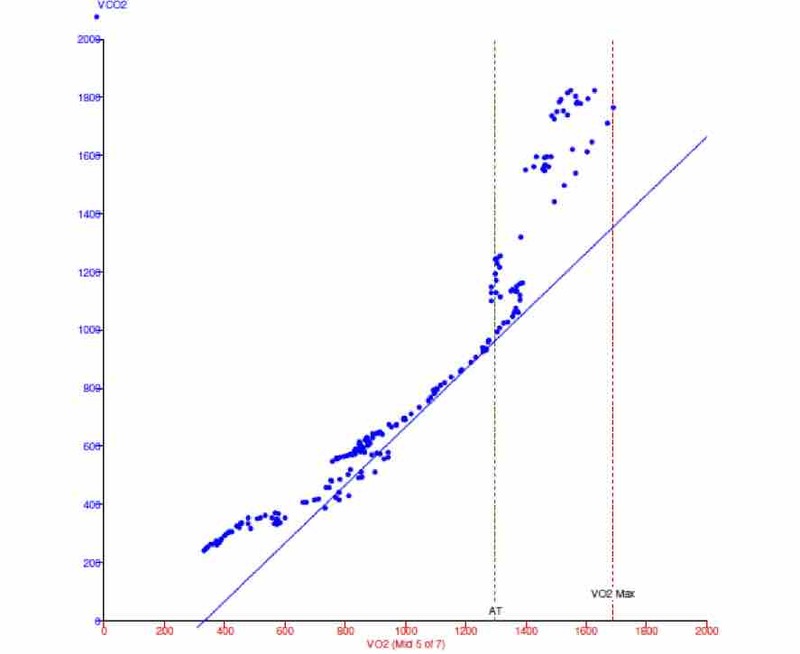 This is shown in the graph where the blue dots (that represent individual measurements) start to rise rapidly. This defines the anaerobic threshold, shown by the green line. This is sometimes called “a change in the V-slope”. 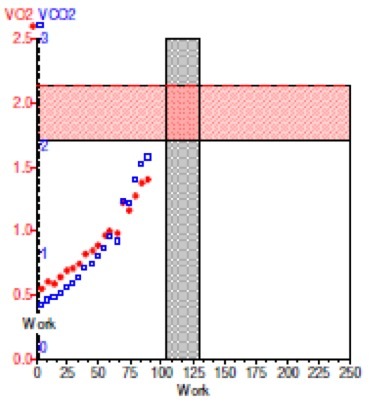 The change in VCO2 compared to the VO2 can also be seen in this graph of the VO2 and VCO2 plotted against the total work performed. 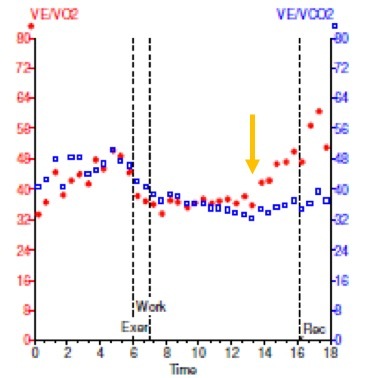 In this case, the VCO2 (blue dots) begins to rise faster than the VO2 (red dots) when the patient switches into anaerobic metabolism result in the two curves crossing at 75 watts of work. The respiratory quotient starts to increase. A normal respiratory quotient (RQ) in a person who is burning up carbohydrates during metabolism is 1.0. If they are metabolizing fat, the RQ is 0.7 and if they are metabolizing protein, the RQ is 0.8. When carbon dioxide is derived from lactic acid, the RQ goes up to a level above 1.0. In this graph, you can see the rise of the RQ (green dots) above the RQ of 1.0 (red dashed line) – this sudden increase in the RQ indicates that the exercising patient just crossed the anaerobic threshold. Sometimes, the RQ (respiratory quotient) will be reported as the RER (respiratory exchange ratio) in a CPET report. The end-tidal oxygen concentration (PETO2) begins to rise. When the muscles switch to anaerobic metabolism, they are no longer primarily consuming oxygen to make energy. Consequently, the lungs extract less oxygen out of the inhaled air. This results in the oxygen in the exhaled air (the PETO2) to start to go up. 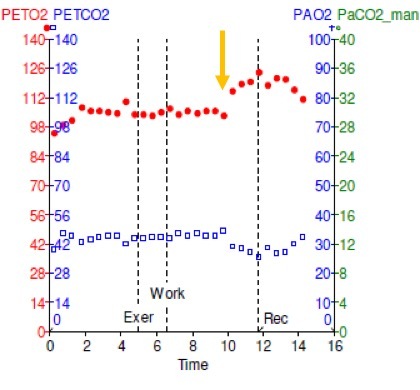 In this graph, the PETO2 was fairly stable at about 110 mm Hg during aerobic metabolism but when the muscles switched to anaerobic metabolism, the PETO2 began to rise (yellow arrow) at the 10 minute mark of the CPET. The ratio of minute ventilation to oxygen uptake begins to rise. During normal aerobic exercise, this ratio is fairly consistent but when the muscles switch to anaerobic metabolism, there is less oxygen being taken up by the lungs (as we saw with the rise in the PETO2 in the previous paragraph). This results in a change in the ratio of the minute ventilation to the oxygen uptake (VE/VO2) so that as the VO2 goes down in anaerobic metabolism (in the denominator of the VE/VO2 equation), the ratio VE/VO2 goes up. This is shown by the rise in the red dots marked by the yellow arrow at the 13 minute mark of this CPET. 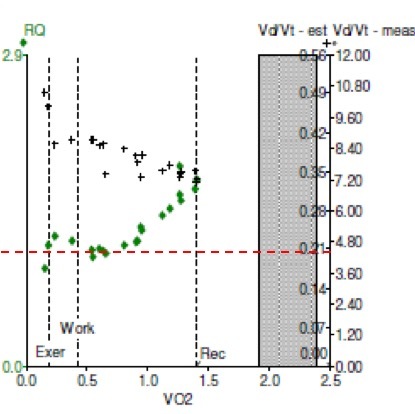 In this case, the VE/VCO2 also goes up after anaerobic threshold but to a lesser degree (blue dots). In the best of possible worlds, all of these markers of anaerobic threshold should happen at the same time. Unfortunately, the anaerobic threshold is not always easy to determine. The graphs never seem to work out like the examples that are usually shown in textbooks. There can be leaks in the mouthpieces and other causes of subtle errors in measurements. Furthermore, anaerobic threshold is not just an all-or-none event for all of the muscles in the body at exactly the same time – some muscle groups go into anaerobic metabolism sooner than others so the anaerobic threshold that we seen on the CPET is really an average of lots of muscle groups all going into anaerobic metabolism at different times. A normal person should reach anaerobic threshold at about 50-60% of their mVO2; if the patient reaches anaerobic threshold at < 40% of the predicted mVO2 then the anaerobic threshold is considered reduced. Another variable that can be useful is the dead space determination. Normally, to calculate the dead space, arterial blood gases are necessary but these are generally not done during most CPETs. You can get a rough estimate of the dead space during exercise by looking at the VE/VCO2 at anaerobic threshold. A value greater than 34 indicates an abnormally increased dead space. This can be caused by lung diseases, pulmonary hypertension, or heart failure. If the dead space goes up extremely high during exercise, think about pulmonary hypertension. Look at the mVO2 (maximum oxygen uptake). If it is < 85% of predicted, then there was abnormal impairment to exercise. Most CEPT reports will give the predicted mVO2 based on the patient’s actual body weight. 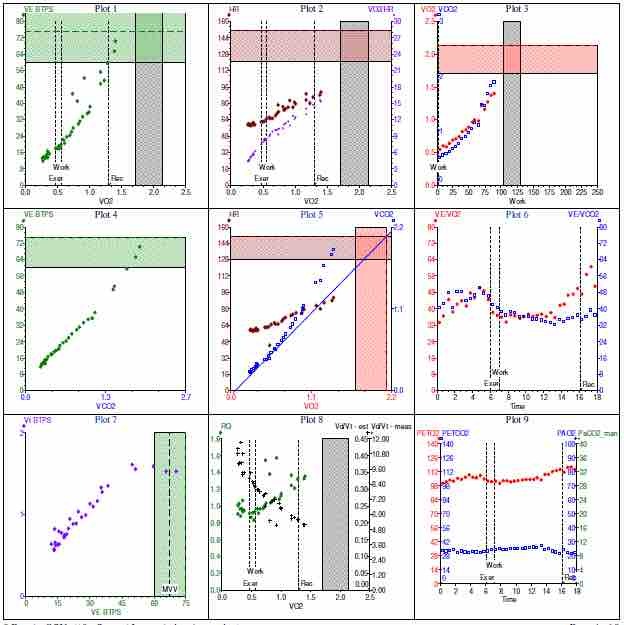 However, if the patient is obese, then it is very helpful to also calculate the predicted mVO2 based on the patient’s ideal body weight. This correction can help you determine if a patient’s low mVO2 is just due to their obesity. Oxygen desaturation of > 4% from baseline. Here is an example of a patient with combined diastolic heart failure, secondary pulmonary hypertension, coronary artery disease, plus interstitial lung disease. The clinical question was which of his diseases was responsible for his shortness of breath? The anaerobic threshold was determined to occur at 10.09 minutes (best seen on Plot 6 of the graphs). First, look at the mVO2 – in his case, it was reduced at 12.4 ml/kg/min (67% of predicted), so exercise was abnormally impaired. Second, determine if he had an adequate ventilatory reserve – he did not since his mVE was 73.8 L (98% of predicted) – this indicates lung disease as a cause of his exercise limitation. Third, determine if he desaturated – he did not since his saturation at peak exercise was 97%. 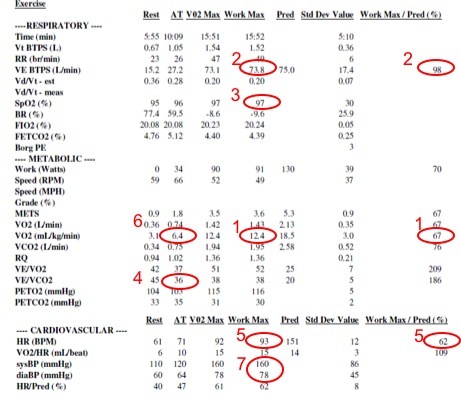 Fourth, determine if he had an excessive dead space – he did since his VE/VCO2 at anaerobic threshold was 36 (anything over 34 being abnormal) – this is further evidence of lung disease. 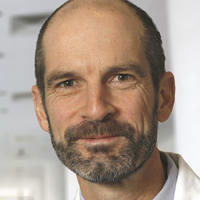 Fifth, determine if he reached his maximum predicted heart rate – he did not since his heart rate at peak exercise was 93 (62% of normal) indicating that it was not his cardiovascular system that limited his exercise. Sixth, determine if the anaerobic threshold is reduced – his anaerobic threshold occurred at a VO2 of 6.4 ml/kg/min which is a VO2 of 34% of his predicted mVO2 (6.4 ÷ 18.5) and therefore reduced since it is less than the normal threshold of 40% of the predicted mVO2. Seventh, determine whether the blood pressure response is normal – his systolic blood pressure rises normally to 160 but his diastolic blood pressure also rises from 60 to 78, which is abnormal – this probably is related to his diastolic heart failure but since the diastolic blood pressure remained < 90 mm Hg, it was probably not the primary limit to exercise. From the exercise test, we can determine that it is his lungs (in his case, the interstitial lung disease), not his heart that is the cause of his impairment. As with many tests in medicine, the results are best interpreted in the context of the individual patient. Therefore, the physician who is familiar with the patient’s history and has done a physical examination is in the best position to accurately interpret the CPET. But for those patients who have shortness of breath and you are unsure if it is due to undiagnosed heart disease, undiagnosed lung disease, obesity, or deconditioning, the CPET can often be tremendously helpful. Also, in those patients who have both known heart disease AND known lung disease, the CPET can help determine which of the two diseases are the cause of shortness of breath and exercise limitation.